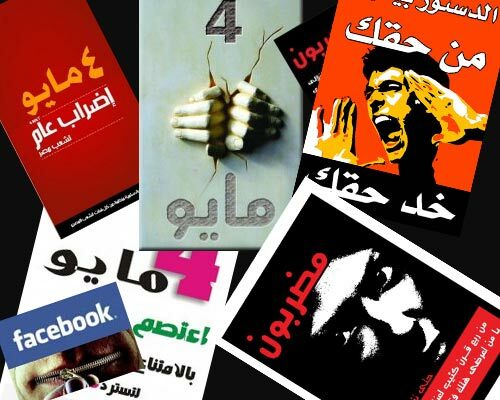 Banners from Egyptian Facebook groups calling for the May 4 Strike. After little less than a month following the April 6 strike  in support of the textile workers in Mahalla City, during which a number of prominent Egyptian bloggers and internet activists were arrested , preparations for the next round of a planned general strike to mark the 80th birthday of President Hosni Mubarak, on May 4, 2008, are currently spreading all over the blogosphere and the Internet. And like the preparation for the April 6 strike , the internet has a vital role to play in mobilizing for the upcoming protest. SMS, email, blogs, Facebook, YouTube, Twitter: almost all of these outlets are used by Egyptian Internet activists in their campaign the May 4 event. We've even seen a Facebookist Movement to Overthrow Mubarak  being created. Another group entitled “We don't want Muslim Brothers ” is calling for the strike but without participation of the Muslim Brotherhood , who recently decided to join May 4 protest . Blogger and activist Nora Younis  was kind enough to agree to this interview over email. Nora shares some of her ideas with us about the role of Internet in Egypt as a platform for political activism. 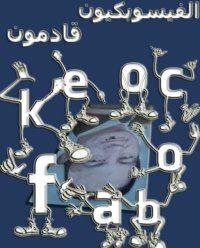 Sami Ben Gharbia: What was the role of internet in mobilizing Egyptian citizens to participate in the April 6 strike and do you believe that the kind of Facebook Group, with its 71,200 members, has an effect on the street? Nora Younis: Internet was the main tool in mobilizing for the 6 April strike. It's true a tiny fringe of Egyptians have access to Facebook but the 70,000+ members of the group acted as strike advocates in the society and took the debate from PC screens to taxis, workplaces, dinner tables and breadlines. This forced the topic on the independent main stream media. The second tool in mobilizing for the strike was SMS. People I have known for years with no relation to politics or public participation were circulating messages advocating the strike. The word “strike” has never been uttered and repeated that much in Egypt during my lifetime. However, we should not forget that what gave April 6 its weight was the labor movement uprising and their struggle for a dignified minimum wage. Internet alone, without the popular base, wouldn't have led to the successful strike we witnessed April 6. Sami: we've seen an anti-strike Facebook group  formed to counter the pro-strike group  and it seems that the political battle is taking place on blogs and on social networking websites. How do you describe this new development and do you believe that the Egyptian government or the ruling party is behind the aforementioned group? Nora: Young members of the ruling party have initiated blogs and Facebook groups to polish the regime's image and counter the call for dissent. Such pages are probably encouraged by party officials, because when it comes to content they lack the passion. Furthermore, they remain unable to attract members and visitors. Sami: It seems that the Egyptian regime is trying to calm down the situation. During the last week many of the previously arrested activist and bloggers have been released such as Khaled Hamza  Salam the editor-in chief of Ikhwanweb , and blogger Mohamed Sharkawy and Esraa  Abdul Fattah. How do you assess the situation in Egypt at this stage? Nora: The Egyptian regime took preemptive measures to abort the April 6 strike by arresting activists early morning from their homes, and taping their calls days before. After the day was over and with the rising riots in Mahalla measures were taken to contain and calm the situation, as a way to weaken the planned May 4 strike. A government delegation headed to Mahalla, met some 2000 textile workers, and promised bonuses and privileges. Government statements have alienated Mahalla workers from the riots. Popular bloggers-activists have been released. All seems to be in attempt to calm the situation before May 4 – the president's 80th birthday. Sami: The use of web tools has caused the arrest of some of those activists, but it also helped release the American student James Karl Buck  who was arrested while photographing the 6 April demonstration. His Twittered message ‘ARRESTED ‘ through his cell phone alerted the world about his arrest. Who do you believe is going to win this new kind of battle of information? Nora: On April 5 the number of my Twitter update  followers was 90. On April 6 it was 130, and today it is 180. Only because I was Twittering strike and detainees updates. James Buck gained wide support through his Twitter SMS. More people are joining the blogsphere, Facebook, and Twitter by the hour. I don't think this could ever be reversed. There is a techie, passionate, frustrated generation now on the playground….and one could only expect more to come. In few years time there will be no need for registration of political parties. Like-minded people will organise and will be heard.